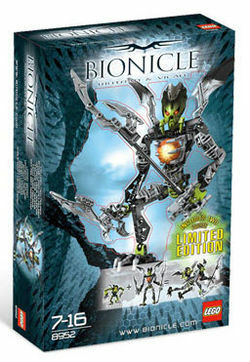 8952 Mutran & Vican is a BIONICLE set released on February 6, 2008. It contains Mutran, a black and green Makuta with a staff, spear, Tridax Pod and wings, and Vican, a Shadow Matoran with claws and wings, who can ride Mutran. It was Wal-Mart exclusive in the US. This is a description taken from LEGO.com. Please do not modify it. (see an archive of the product's page) Mad genius of the Makuta! Deep in the heart of a vast hive, evil Makuta Mutran and his servant Vican guard the shadow leech vats. With claws, blades, spears and armored wings, they are prepared to fight off any attack. Set includes both figures, Tridak pod with shadow leeches, and more! Figures combine so they can go into battle together! Mutran has claws, fangs, wings, blade, Tridak pod with shadow leeches, and a 9" (23cm) long spear! Vican has red eyes, wings and claws! Mutran stands 9" (23cm) tall and Vican is 4½" (11cm) tall! Facts about "8952 Mutran and Vican"
Mad genius of the Makuta!